Owner Jamie Collins, her son Ivan Kale born in July 2013, partner Avtonom Ordjonikidze and and a whole crew of staff. In 1997 Jamie Collins was at a crossroads. She was working as a social worker in LA, burned out and looking for a change. That year she left her job and hit the road with her dog Ziggy to see the rest of the West Coast and think about options. The diversity of crops she rolled past on her coastal trip inspired her next move: enrollment in the Crop and Fruit Science program at Cal Poly in San Luis Obispo. One college degree later, Jamie leased four acres on the Monterey Peninsula at the age of 27. She was working multiple jobs and tending her first crop of beets, carrots, kale, green beans and sunflowers in the evenings. It was hard, but friends helped out and more experienced farmers shared advice. Over the next 15 years Jamie's skills have grown alongside the growth of Serendipity Farm. She is a treasured farmer in the area having won awards for her heirloom fruit, writing and dedication to the field. 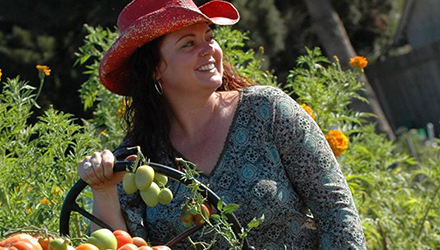 While overseeing the farm Jamie also serves as an organic farm consultant, a farm and process inspector for California Certified Organic Farmers and a farm and food writer with a column in Edible Monterey Bay. Today Serendipity Farms raises more than 50 varieties of organic vegetables, herbs and flowers on 20 acres in Carmel Valley and Aromas. The different microclimates allow the farm to grow a huge variety of produce, from the fog zone-loving row crops, raspberries and strawberries grown on the historic Odello Ranch at the mouth of Carmel Valley to the inland heat lovers like tomatoes and basil that ripen on the mid-Valley parcel. On the homestead in Aromas are the Meyer lemon, avocado, figs and guava trees, plus the blackberries, tayberries and greenhouse-started herbs. In early 2014 the farm leased one acre of blueberries in Corralitos that is now producing organic blueberries. As from the start, Serendipity remains a strictly organic concern and carries full certification by California Certified Organic Farmers. Serendipity Farms has never used pest control, not even organic approved pesticides, instead relying on beneficial insects to keep pests in check. Crop rotation keeps soil healthy and productive, with only fish-based fertilizer and slow-released bat guano added to boost nutrients (plus goat, chicken and horse manure for the perennial tree crops).